GoTrusted's Group & Business plans give concerned employers or multi-member households peace-of-mind by knowing that wherever their users connect to the internet, wireless or wired, they'll be protected by GoTrusted security. GoTrusted's service is easy to manage as well... because no configuration is required on your user's laptops. The Group & Business plans have the added benefit of discounted monthly and yearly rates over the individual plans. 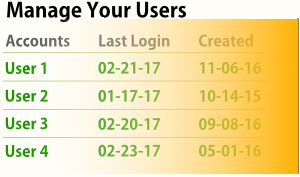 Once you sign up and your account is approved, you'll receive a company account code for your users to create their own accounts as they register for the service for the first time. There's nothing else needed to deploy the service! Monthly group plans are $6.99/mo per user. Cancel anytime. Users must have Administrator (or Owner) privileges on laptop systems to install GoTrusted Software.